Thirsty Pilgrim: Unlike Most Supermarkets We Make Our Blog Posts Fresh Day and Night. Unlike Most Supermarkets We Make Our Blog Posts Fresh Day and Night. We've had some fine Flemish adventures in the past few days. These included visits to the outstanding Hommelhof restaurant, the hospitable Struise farm, and two trips to Westvleteren. Sadly I have no time to do them justice at the moment. Too busy making the donuts and the duckets. 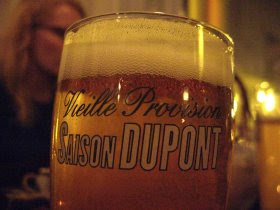 Instead I'll take this moment to share with you this old-school Saison Dupont glass spotted a Brussels café. You probably don't know this place yet. You will. As soon as Around Brussels in 80 Beers is published. Besides the saison there is draft Taras Boulba, the food is excellent, and the place is totally non-smoking. I'm tempted to tell you all about it anyway, as a token of goodwill. Maybe I will. But not now. Again, no time to do it justice. There was a point to all this. Oh yeah: Is that a cool glass or what? I need that glass...where can I find one? I may be in Brussels longer come this June (for a week) as I have a meeting in Tokyo right after my meeting in Brussels. I will keep you posted... oh about that glass, where would a glass collector find such an unique and wonderful item? I'm actually not sure. I reckon the restaurant got it from the brewery. I'll ask at the brewery café next time I'm there. The US importer has an online shop with the glasses. Nice. Thanks for the link. Couple of lovelies there.